Do you have more stuff than you know what to do with? Are you looking for an outdoor storage option that you can use to keep and organize all of your extra tools and toys? If this is you, then it is time to invest in a high-quality garden shed! Our garden sheds come in two varieties: peaked and sloped. Both options come with their benefits. The peaked roof creates an added level of protection in snowier climates because it prevents feet of snow from accumulating on the shed during those long winter months. The sloped version has a flatter roof and is great in less snowy climates or ideal for placing near the home with the slop directing water further away from your foundation. The other main difference between the two styles is the price point. A sloped roof garden shed will run you $675 plus shipping while the peaked version will cost $775 plus shipping. Either way, you are getting a high-quality garden shed from a company you can trust. The best thing about our garden sheds is that they pretty much pay for themselves. You can use these sheds to store just about everything, keeping your treasured items safe from harm and the outside elements. Your options go well beyond gardening, too. 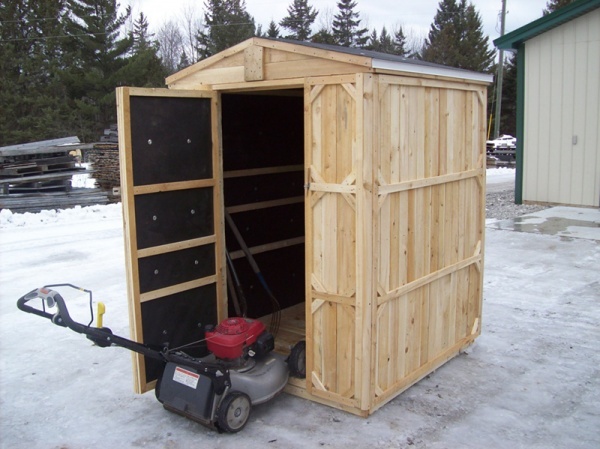 Either shed option is perfect for storing your lawnmower or string trimmer when not in use. If you have a pool, you can even use this spacious shed to house all of your supplies or pool toys – floaties, chemicals, steps and more – giving you a convenient place to organize in every season. If you have a large family and little ones in the house, then you know how their outdoor toys can really pile up. Use your shed to store these items. Keep your soccer balls, hockey sticks and other outdoor toys locked up inside and enjoy them whenever you want. These options are just the tip of the iceberg. You can also use a shed for your camping supplies, planting and potting supplies, power tools, hunting targets and much more. If you need are in need of more storage options, then give Productive Cedar Products a call and order your own garden shed today. We have a full stock ready to move, backed by our friendly customer service and a dedication to quality that is beyond comparison. Order your garden shed today by calling us at 989-727-4902.